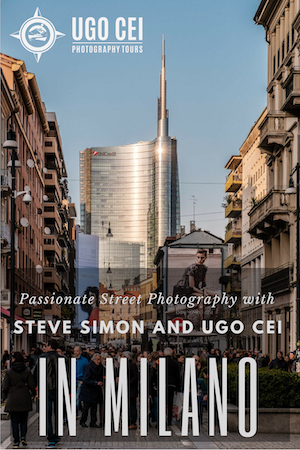 When discussions turn to the topic of camera bags, photographers can become just as zealous as they do when they discuss the very cameras that inhabit them. 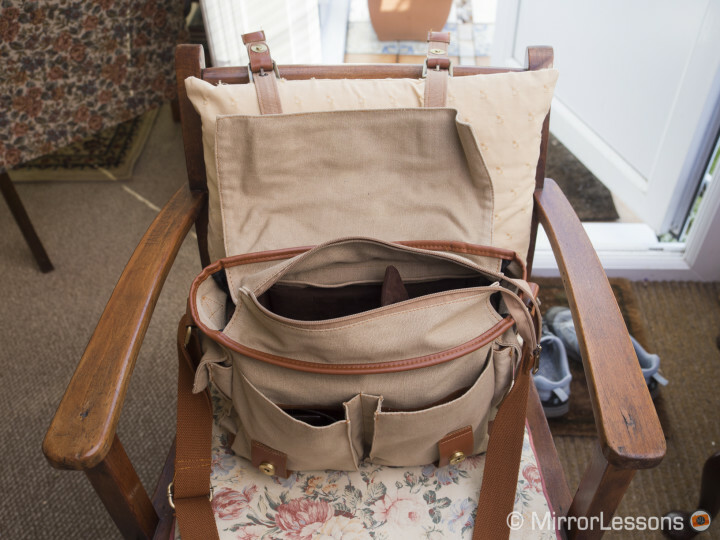 Discovering the perfect bag for your gear and style of working is incredibly satisfying, but unfortunately it usually takes many failed purchases to find the right one. Does it have the right number of pockets? Is the strap comfortable? Is it weatherproof? Does it fit your camera with a lens attached? Does the style appeal to you? There are many questions you must ask yourself before settling on a specific model. 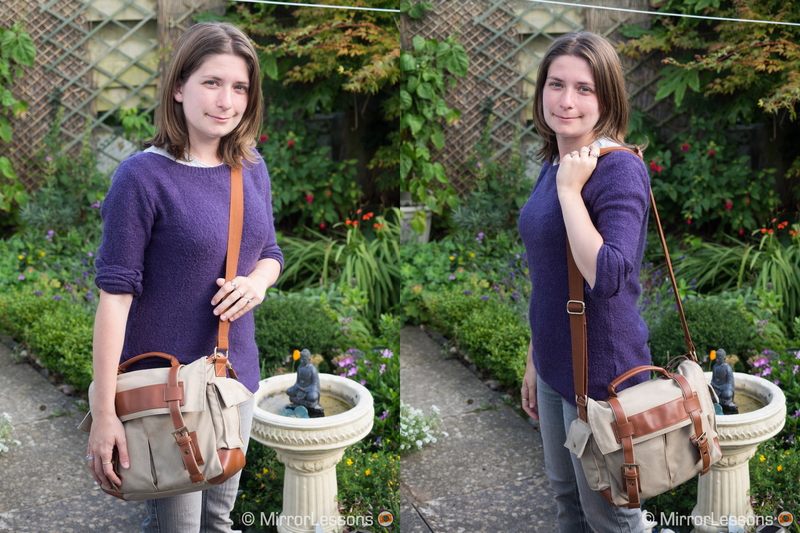 The latest bag we’ve had the opportunity to try is the handmade Oliday Canvas Camera Bag for mirrorless and small DSLRs. 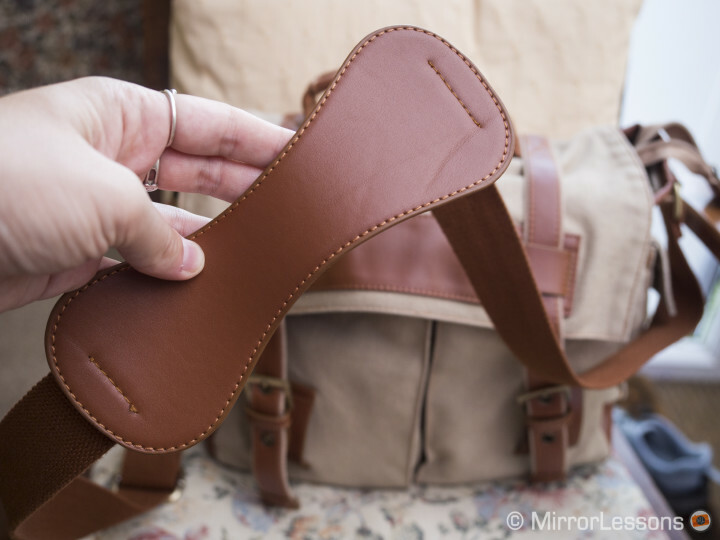 Compared to other popular camera bag brands, Oliday is relatively unknown, which is actually what piqued my interest in the first place as I was browsing around the Etsy camera bag store. Oliday focusses its energies on designing lifestyle and tech accessories, from the camera bag you see here to iPhone cases and laptop bags. Inspired by many sources in the field of art, fashion and design, they enjoy experimenting with various materials such as leather, wool felt and washable paper. 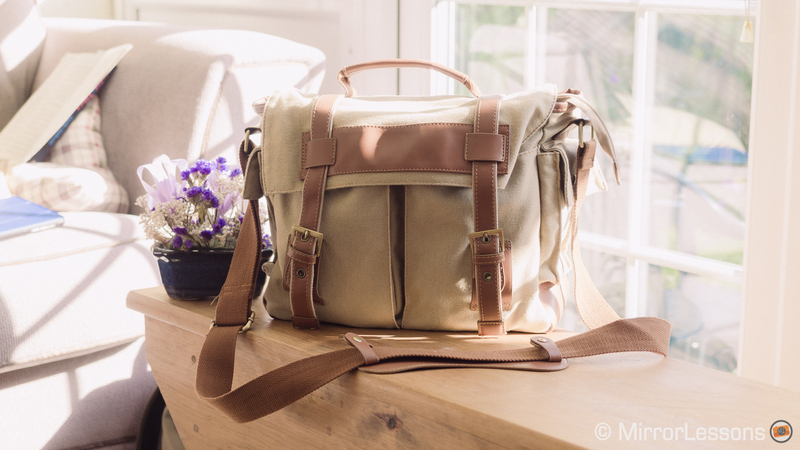 The Canvas Camera Bag caught my eye due to its stylish and practical form. It is made of water-resistant canvas, comes in two colours (tan and dark green), and features brown leather accents on the two belt buckles that keep the bag closed, the flap, the handle, the padded part of the strap, and the edges around the opening. When you open the bag, the various pockets and openings are revealed. 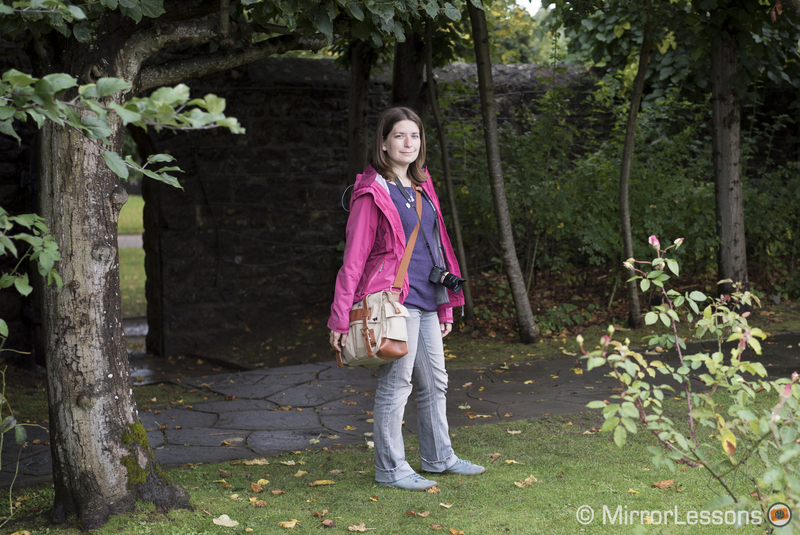 You have one large opening for your camera and lenses which can be zipped closed for protection, as well as four pockets–two very spacious ones at the front and two smaller ones on the side. I generally keep my wallet and memory card holder in the front pockets, while the side pockets are reserved for my remote timer, spare batteries and iPhone. 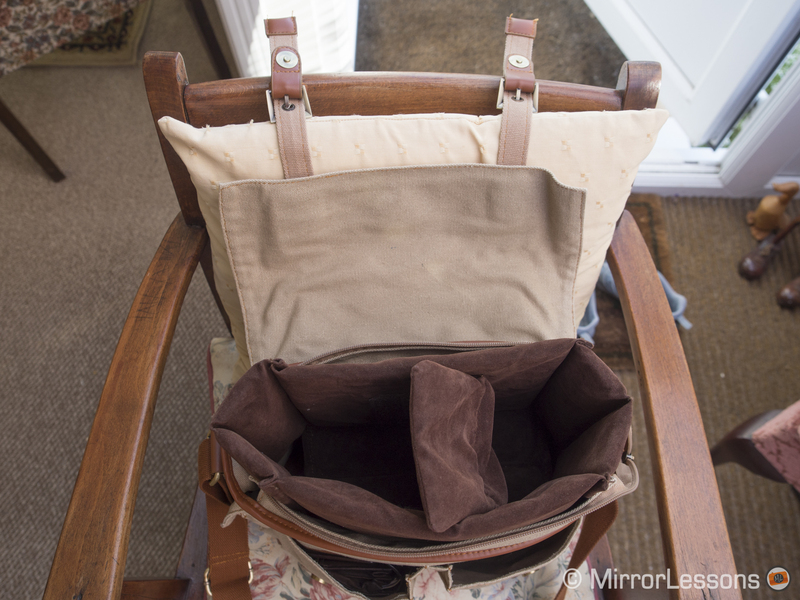 Whereas the side pockets can be closed with a flap and magnetic button, the front pockets cannot be closed. On the inside, there is a padded camera insert to stop your camera and lenses from shifting around and knocking into each other inside the bag. You can adjust the size of the two compartments by moving the centre piece to the left or right and attaching it to the velcro on the wall of the insert. If you own a mirrorless camera, you will comfortably be able to fit a camera with a lens attached in the large compartment, and an extra lens in the smaller one. Overall, it is a very nice and malleable design. The only warning I have about the insert is that it seems to attract some dust. It also has a strange odour when you first remove it from the packaging. For these reasons, it is a good idea to remove the insert and air out both the bag and insert on a washing line before using them. 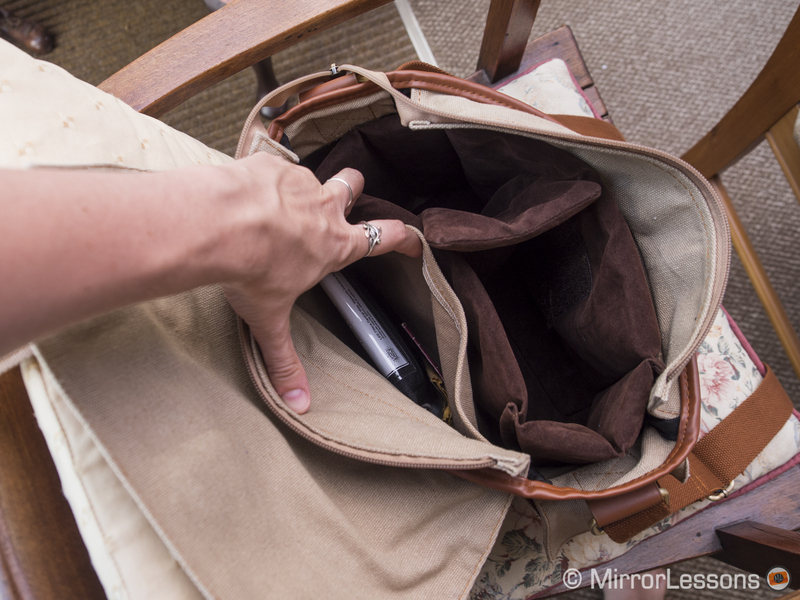 You will also find another large flat pocket on the inside where you can store documents, filters, cloths and so on. 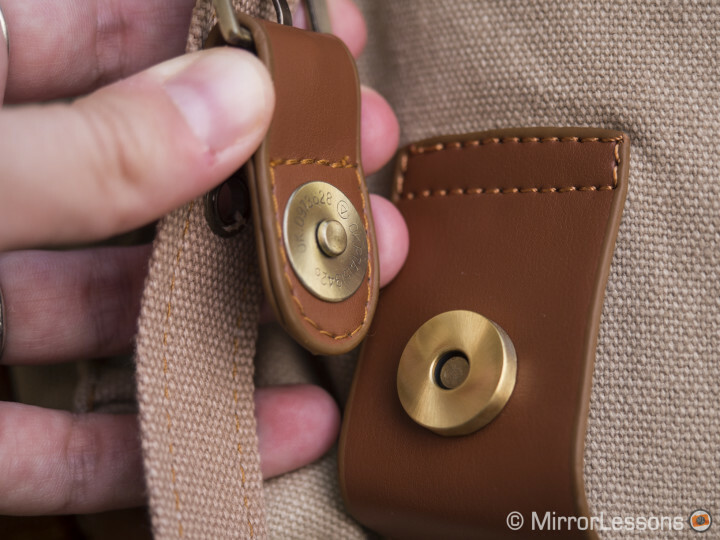 I find this pocket very useful, but I would have been even more pleased if there had been a similar pocket on the outside of the bag for those moments when unlatching the belt buckles, unzipping the bag and fishing around for an item isn’t practical, such as when I’m walking. In between the insert and the pocket, you can actually fit a 13″ MacBook Air. The corners slightly stick out from underneath the flap but otherwise, it is well-protected as it is wedged between your body and the insert. As I mentioned above, the bag opens and closes via two belt buckles. Each buckle features a metallic button that magnetically attaches to the bag. Looking at the bag from a distance, it appears that the bag must be opened by undoing the buckle, so much so that I spent my first minute with the bag fiddling with the buckle, completely oblivious to the presence of the buttons! Overall, they work very well and seem to be very well-made, just like the rest of the bag. To make carrying the bag more comfortable, Oliday has provided a leather pad that slides along the nylon shoulder strap. Although it is a very nice and comfortable addition, I find it tends to slide around a little too much, and will often rotate on itself. If I were Oliday, I probably would have sewn the pad in place. There are two ways you can wear the Oliday Canvas Bag: you can either have it ride across your chest, or hold it at your side. Both ways are comfortable and convenient. When you’re in a hurry to move the bag from one spot to another, you can also use the handle but if you do, make sure the bag is closed because the front pockets are not covered by a flap. 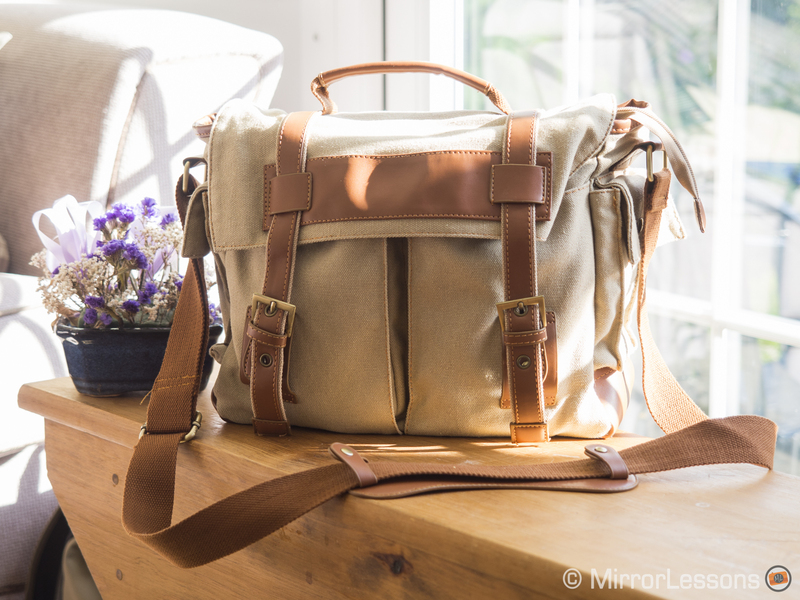 For photographers, the most important aspect of any bag is comfort, and the Oliday canvas bag is certainly a pleasure to use as long as you stick to carrying around the amount of gear recommended on the Oliday Etsy page: one camera, two lenses, a tablet and a few accessories. Once you start to overload the bag, you will begin to feel some discomfort in your shoulder muscles, but this is only normal. At the very reasonable price of $65, I wouldn’t hesitate to recommend this camera bag to mirrorless and small DSLR users. It is fashionable, practical and comfortable, which is all you could ask for from a bag of this kind.